GREENSBORO, N.C.--(BUSINESS WIRE)-- The Board of Directors of VF Corporation (NYSE: VFC), a global leader in branded lifestyle apparel, footwear and accessories, today announced that President & Chief Operating Officer Steven E. Rendle will become the company’s Chief Executive Officer, effective Jan. 1, 2017. Rendle, 57, will succeed CEO Eric C. Wiseman who will continue to serve as Executive Chairman of VF’s Board of Directors. 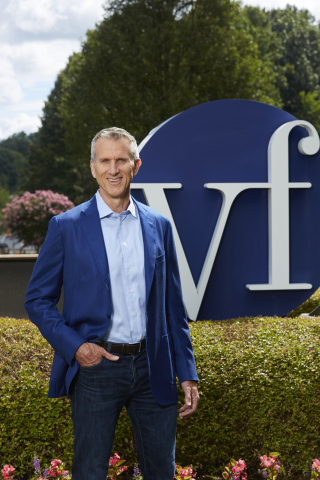 Steve Rendle to Become CEO of VF Corporation on January 1, 2017 (Photo: Business Wire). As President & Chief Operating Officer, Rendle has overseen all of VF's business coalitions worldwide: Outdoor & Action Sports, Jeanswear, Imagewear and Sportswear. He’s been responsible for VF's global Supply Chain and Direct-to-Consumer platforms. He has been a member of VF's Board of Directors since June, 2015. Rendle has more than 30 years of experience in the specialty outdoor and action sports industry, 16 of which have been with VF. Previously, he spent three years as Vice President, VF Corporation and Group President, Outdoor & Action Sports Americas, leading VF's Outdoor & Action Sports Americas businesses in North and South America. He also served as President of VF Outdoor Americas, where he oversaw The North Face®, JanSport®, Eagle Creek® and lucy® brands, as well as business development for the coalition. From 2004 to 2011, he served as President of The North Face® brand. He began his career with The North Face® brand in 1999. Rendle earned a B.S. degree in Kinesiology from the University of Washington. He serves on the Board of Directors of Advanced Functional Fabrics of America, Inc. (AFFOA), an organization working to enable a manufacturing-based approach to transforming traditional fibers, yarns, and fabrics into highly sophisticated, integrated and networked devices and systems. Rendle is a founding board member of the Outdoor Industry Association's Outdoor Foundation. He has also served in an advisory capacity to Bainbridge Graduate Institute and provided insight into its creation of an M.B.A. program concentration focused on sustainability. Rendle was honored with The Mountain Institute's annual Exemplary Corporate Stewardship of Mountains award in 2007. VF Corporation (NYSE: VFC) is a global leader in the design, manufacture, marketing and distribution of branded lifestyle apparel, footwear and accessories. The company’s diversified portfolio of powerful brands spans numerous geographies, product categories, consumer demographics and sales channels, giving VF a unique industry position and the ability to create sustainable, long-term growth for our customers and shareholders. The company’s largest brands are The North Face®, Vans®, Timberland®, Wrangler®, Lee® and Nautica®. For more information, visit www.vfc.com.